Slightly rougher than expected, but with a lovely taste all its own. You’re unlikely to get Renegade Rums anywhere in Canada unless you troll in obscure stores that may have ‘em gathering dust somewhere. In speaking to purchasing agents and spirits managers from Co-op, Liquor Depot and KWM, they all tell me the same thing – the rums are loss leaders and move off the shelves too slowly. And that’s a shame, really, for while I’ll be the first to concede that the line is uneven at best (remember my snarky comments on the Guadeloupe? ), Bruichladdich does take a “cask expression” whisky approach to the product that I wish we could see more of in the rum world by the major brands. 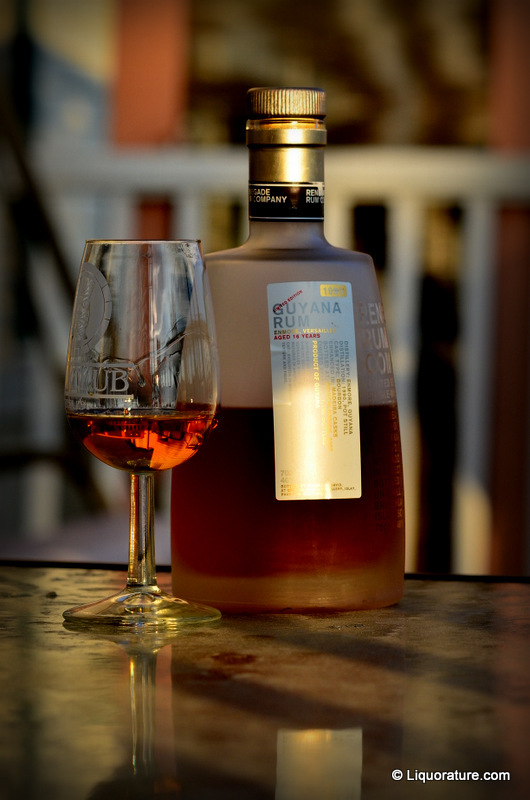 They’re not the best rums of their kind that are made (I trend towards Rum Nation for that accolade in spite of their refusal to go over 40% ABV in their products)…but surely among the most innovative and interesting. 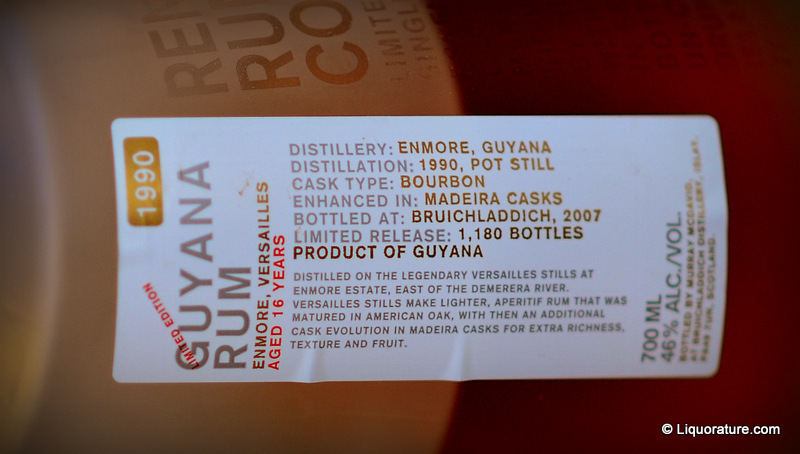 As the label notes, this is a Guyanese rum sourced from the Enmore distillery’s Versailles pot still in 1990, aged there and then finished in Madeira casks; as with Cadenhead, there is no chill filtration or additives of any kind, and the rum is brought down to Bruichladdich’s standard drinking strength of 46% by the addition of distilled water. Renegade’s awesomely cool minimalist frosted glass bottle remains the standard one I like so much…you see this in a shop, you pretty much have your eye dragged to it as if RuPaul just passed by. At 46% strength, you expect (and get) a spicy animal – I followed my standard practice of allowing it to open a bit (I rarely add a drop of water to open a rum up unless it’s a raging overproof), and when I sniffed it, got vanilla and brown sugar notes that morphed into a darker, heated aroma like Anakin turning to the dark side. “Cough syrup! Plasticine!” bugled the Last Hippie as he tried a dram the other night, yet I disagree: the rum deepened and became richer as it settled, evincing hints of fleshy fruits, peaches, cherries…I thought it pretty damned good. On the palate, to my surprise, it tasted something like a heated, cherry-infused chocolate, and was not as smooth as I would have expected for a rum aged for sixteen years. Yes I tasted licorice, vanilla and sweet raisins, and initially these were a shade raw, untamed…they were like Westeros’s Iron Throne, always ready to cut and slice you in an unguarded moment: still, my advice would be to stick around, because for the most part that’s just the initial jolt: it gradually faded into a sort of creamy brininess, dying out into an arid profile of chocolate and musky old leather, with a long and lasting finish redolent of caramel and a less-than-preferable lingering creaminess. Quite unusual, and not at all what el Dorado 15 (for example) would have prepared you for. This is what I mean about both the inconsistency and the originality of the line. Partly it’s the finishing in different casks, partly it’s where it’s being aged (I may be wrong, but I do believe that this rum was aged in Scotland, the profile is so much like a younger product) – commercial establishments simply don’t get to have tastes like these, and love it or hate it, you can’t deny that it’s unusual. Are you prepared to dump about sixty Euros or seventy bucks on this? Hard to tell – my take is that I liked the Guyana 16 even for those rougher edges. I can get enough smooth-as-silk offerings at 40% and love them for precisely that reason – this baby might require some taming and in that resides my enjoyment (you may feel the opposite). So then. Summing up. It’s got a crazy coffin, an out of left field taste, good-yet-rough fade, and presentation unique enough that when you place a bottle on the table of the bash your wife forced you out of your LazyBoy to attend, you can be assured of drawing all of her guests. They ooh and ahh. They point and snap pictures with their iphones. They offer some variation of “Nice rum” before invariably asking two questions, always the same two questions: “How much?” (enough) and “How good?” (quite). No one ever asks, “Why?” That’s just as well, because the answer is, essentially, “Why not?” Bruichladdich made this rum because they were creative Big Bang Theory addicts, and because they could, and maybe because they were trying their secondary-finish-whisky philosophy on rums to gain market share and a wider audience. But for me, the rum has no need to be anything other than what it is and needs no real marketing or other extravagances. Perhaps the only reason it has that look to it is because it’s so damn cool. And if that and the taste aren’t reasons enough for you, then buy a Bacardi or Lemon Hart and be done with it because, let’s face it, you’re just not that into rums. By 2016 nomenclature, this is not an “Enmore” rum. Such a rum, these days, is a product coming off the Enmore wooden Coffey still, not a rum that came from the Versailles pot still which was once in the physical location of Enmore estate. Strictly speaking, this is a Versailles rum…which makes it just as interesting.